In the warmer months, our hair might need a little bit more attention. I’ve tried out many hair products to protect my hair over the summer months and I’ve narrowed it down to just three essentials that I’ve been using recently. 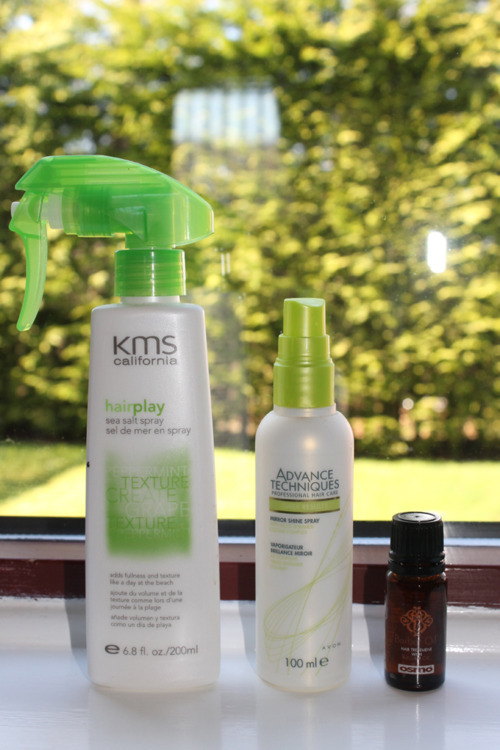 Here are some of my hair essentials for Spring/Summer! I’ve been obsessed with this stuff since I bought it a couple of weeks ago, what says summer more than beachy waves? I’ve been very low maintenance with my hair recently, leaving it to dry or just not straightening it and it’s in a great condition. I love spraying this onto my hair just after i've washed it to get more defined wavy curls. A little tip for anyone who uses dry shampoo also, spray this onto your hair before you go to bed and it will be oil free, such a lifesaver! You can spray a ton on your hair and it won’t become greasy which is a huge bonus. I’ve bought this product on and off for a few years now and I still love it. I find it hard to get my hair looking shiny, especially in the warmer months so this product is great to keep it looking healthy and shiny! When we were at the IWD event in Glasgow recently, this little product was in our goody bag. I hadn’t tried it as soon after the event but when Lisa told me it was one of her favourite oils I had to try it, and I wasn’t disappointed! I would say in terms of the formula thickness that it’s in-between Mythic Oil and Moroccan Oil so it’s perfect if you think Moroccan Oil can be a little bit too heavy for your hair. Since most days I don’t use conditioner on my hair (weighs it down) I use oils to give it some extra moisture to keep it from looking too dry. As it contains UV protection, it’s perfect for summer.